Spatial distribution is fundamental for understanding species coexistence mechanisms in forest communities. Here we comprehensively explored fine-scale spatial patterns of tree species in a secondary warm-temperate deciduous broad-leaved forest community in north China. Aggregated distribution patterns were predominant. Species functional traits had no significant effects on their spatial patterns. The aggregation intensity decreased with increasing DBH and abundance. The multivariate linear stepwise regression showed that abundance and maximum DBH were correlated with the aggregation intensity. Our results partially confirm that species attributes (abundance, DBH) and habitat heterogeneity may primarily contribute to spatial patterns and species coexistence in this secondary forest. Project funding: This study was supported by the National Key R&D Program of China (2017YFC0505601), the National Natural Science Foundation of China (31570630) and State Key Laboratory of Forest and Soil Ecology (LFSE2015-13). We are grateful to many field workers for their contributions to the establishment and first census of the 20-ha DLS forest dynamics plot. 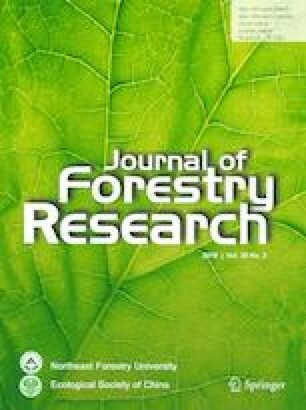 This study was supported by the National Key R&D Program of China (2017YFC0505601), the National Natural Science Foundation of China (31570630) and State Key Laboratory of Forest and Soil Ecology (LFSE2015-13).